Northland Locals Winter Special Offer! Looking for something a little bit different to try this winter – why not come up and have some fun with our super fluffy horses? 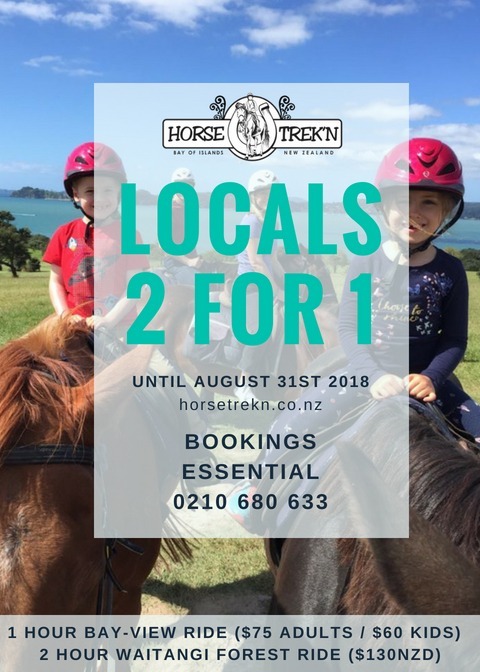 Up here in the Bay of Islands we’re lucky to experience lovely mild winters and so we are offering all of our lovely Northland locals the opportunity to try something new this winter and shout a friend a ride with our amazing 2 for 1 deal! That’s right, get in touch today and as long as you are local we’ll offer you the chance to ride 2 for 1 across all of our winter rides. Whether you are a beginner and fancy giving it a go with the family or a friend for the first time – or if you are more experienced and fancy a good gallop through the Waitangi Forest we have something for everyone! Due to its popularity we will be extending our offer through until the end of August 2018 including the kids summer holidays! Bookings are essential and normal booking terms and conditions apply – so give us a call today!